My last post here was in Swedish and if you don’t speak that language it was probably pretty incomprehensible. Spiral Dynamics is one of my favourite theories about human development. It’s a bit like Maslow’s hierarchy of needs, but based on values and worldviews. If you’re not familiar with it, I envy you in the same way as I envy people who haven’t watched The Sopranos. Excitement, insight and suspense lies ahead of you. The messy image here below is something that came to mind recently. Most of my insights these days come from drawing – not writing. It is an exploration of an earlier image which I did for this APF blog post called Futurist as Trickster. Here the trickster – the lord of in-between – travels above the nodes and links in a colourful network. I started to draw this to understand the role of the trickster and used different colours, which I then realised were Spiral Dynamics colours. Some people don’t like the colour coding in Spiral Dynamics, but for aesthetics it beats other models of human development based on boring black and white diagrams. Anyway, let’s look at the image. The largest nodes are the blue ones. The organised, structured powerful systems within this network. They are linked together with other blue dots – some of them are smaller, but all are grounded, mature and have been around for a while. Some of them are very old. The newer blue dots have support from the old. Blue dots tend to grow bigger and bigger. The biggest blue dots have to be careful so that they don’t stagnate and become irrelevant due to their weight. Almost as powerful and strong are the orange nodes. They are however more dynamic, flexible and much faster. They have more knowledge about the system as a whole and can see where new orange nodes is needed to strengthen the network. Orange is the fire flowing through the system. A ruthless growth for good and bad. Unlike blue who grow by becoming heavier, orange tend to grow by taking over other orange or red dots, or by expanding the network. But like blue, orange nodes can also stagnate if they become too big. When this happens, the problem is often that they are so powerful in the network that everyone is affected. Orange nodes have often grown out of the tiny red dots. Red is the creative destroyer, the small, nimble, but vulnerable entity. These are very fast, and can create a lot of damage to the old and powerful blue and orange. There are many red dots in the network. To red nodes, “eat or be eaten” is the rule of the game. It’s a tough world and either they can survive long enough to grow into a larger, stronger orange/blue dot, or they will burn out or fade away. There are red dots which are solo, but also clusters of red, with no connection to the larger nodes. These are located at the edges of the network. Among these outsiders most new and radical ideas form. 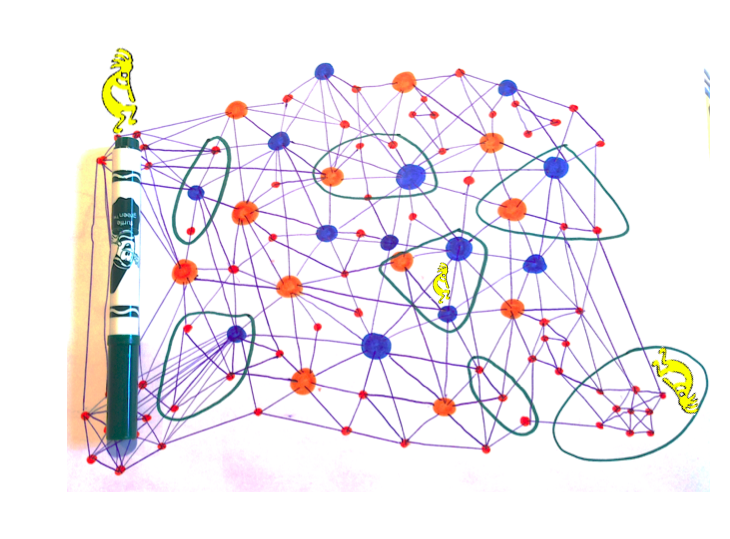 Green has developed out of orange and blue to become a larger entity than individual nodes. These form some kind of rings which try to pull nodes of different colour together. They have the ability to see the whole network and they strive to connect and include all nodes. This is hard work as the other colours don’t see the point of connecting with anyone except for their own colour unless they get something out of it. But the green community builders fight and sing to make nodes collaborate, to create links where they don’t exist, to bring nodes of all colours together in harmony. Yellow is the aforementioned trickster in the image. There’s not much of this colour in the network. Yellow wants to make the system beautiful. The system will correct itself and yellow knows this, and works to help this natural evolution. There are no yellow nodes. Yellow strives to become the system, but is still only the trickster flowing in the system – trying to be the network. Yellow wants to draw and paint the system so that it becomes stable, balanced and whole (like the tricksters in the picture below). 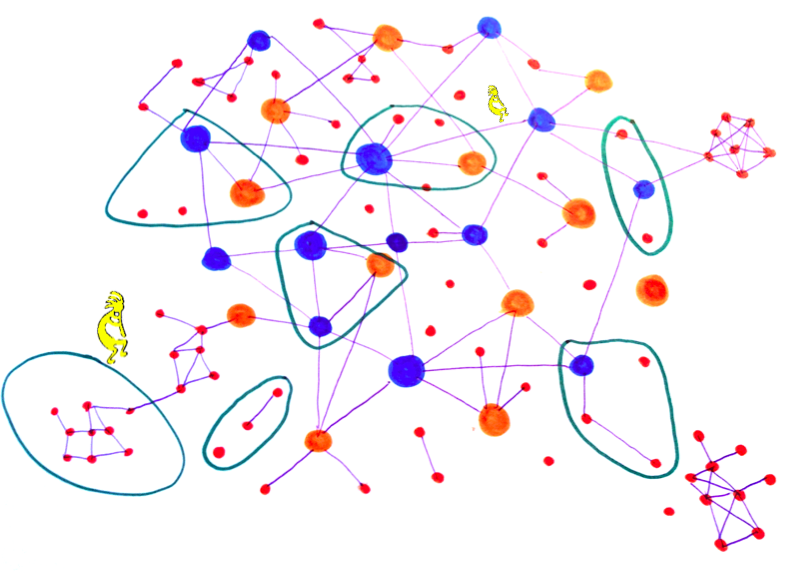 In the same way as green, yellow seeks interconnected harmony, but not by bringing nodes together in unity – rather by linking and optimizing nodes, clusters and the whole. – What are the links? – Why do I write these posts?